There were no guests for the morning ride, so we did a short training session instead. The older elephants – each with a groom on its back – were being put through their routine, while the six calves wrestled and played together. 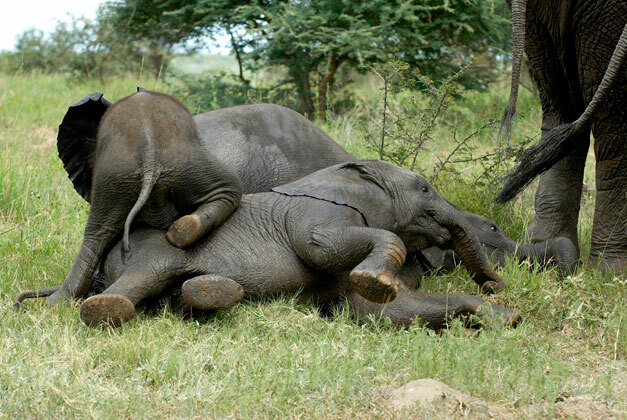 During their games young Mambo found himself uncustomarily stuck at the very bottom of a heap of baby elephants. Unable to get to up, he panicked and gave out a single, small bellow. With that his mother, Lundi, broke ranks and ran over to free the indignant little elephant from the ‘scrum’. There was absolutely nothing her groom could do to rein her in or stop her. She charged up to the pile of youngsters and pushed them off Mambo with her trunk. Once he was back on his feet and she’d ascertained that – bruised ego aside – he was fine, the protective Mom calmly backed up and rejoined her place in the line. It just goes to show that nothing can stand between a mother elephant and her calf. Elephants have strong individual personalities that affect how they interact with other elephants, how others perceive them, and how well they are able to influence members of their group. Some elephants are popular while others are not. Some elephants show great leadership qualities, others do not; some are kind and outgoing, others are more self-absorbed.